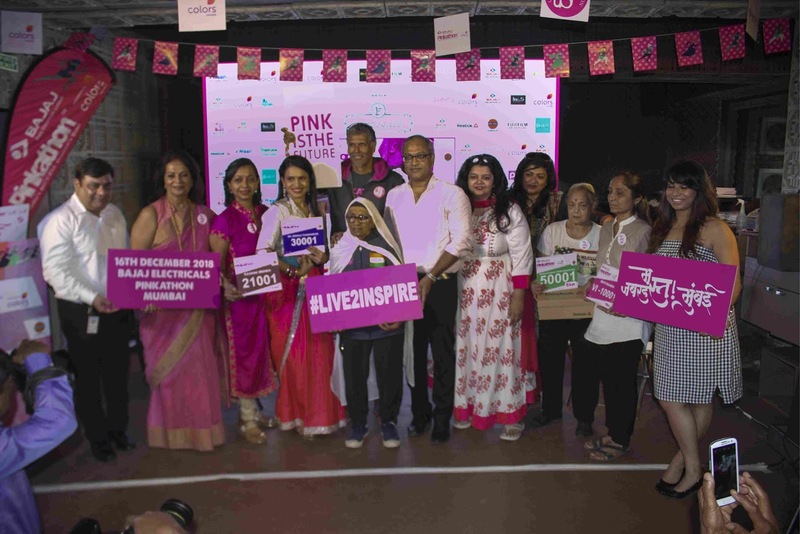 Mumbai, November 13, 2018…The seventh edition of Bajaj Electricals Pinkathon Mumbai 2018 presented by COLORS, India’s biggest women’s run to be held on Sunday, 16th December 2018 at MMRDA Ground, One BKC Building, BKC, Mumbai. Online registrations for the multi-category run are open at www.pinkathon.in/mumbai for the VWash Plus 3km, 5km & 10km run and for the 21km distance drop a mail on info@pinkathon.in. Bajaj Electricals Pinkathon - Empowering Indian Women, India's biggest women’s run to encourage and promote fitness & health among women and create awareness for Breast Cancer and other issues relating to women’s health is supported by United Sisters Foundation and promoted by Maximus MICE & Media Solutions. Super model, actor, Ultraman and Pinkathon founder Milind Soman formally announced the launch of the seventh edition of Bajaj Electricals Pinkathon Mumbai 2018 presented by COLORS at a press conference hosted by The Farzi Cafe, Kamala Mills, Lower Parel, Mumbai. Bajaj Electricals Ltd., a globally renowned and India’s leading consumer products company has come on board as title sponsors of Pinkathon, India’s biggest run for women after being the inspiring partners for last 4 years. Hemal Vadera, Head - Advertising, Digital & Branding of Bajaj Electricals Ltd. said, “Bajaj Electricals Ltd. has always collaborated with platforms that have worked towards women empowerment. We strongly feel that empowerment goes far beyond giving equal rights to women. It is about making women confident enough to trust themselves, act independently and most importantly to take control of one's own health and wellbeing. Present at the conference were eminent dignitaries like 103-year-old Mann Kaur, world champion and an Indian track – and – field athlete, she holds the world record in the over 100 years old category, Mr. Hemal Vadera from Bajaj Electricals, Head – Advertising, Digital & Branding, Dr. Shishir Shetty from Apollo Foundation along with four Bajaj Electricals Pinkathon Mumbai mascots who expressed their wholehearted support for the noble cause.